Oh sure, there were the bigger moments. Yelling ‘TIMBER’ as we cut down the Christmas tree and the annual embarrassing of my children as I sing ‘Oh Christmas Tree’ in my best opera voice standing there in the middle of the tree farm as my kids beg me to stop. And, of course, there was Thanksgiving in all of it’s nap inducing glory. But, in between those seemingly bigger moments there many, many moments of just…well…being. And we needed them. On Friday morning, I found myself standing in my kitchen just soaking in the sweetness of the sounds around me. The familiar strains of Christmas songs playing in the background. Through the door to the dining room I could hear my husband and son talking and laughing as they worked on the giant puzzle spread out on the table. My daughter was happily playing in her imaginary world which that morning included rigging up her stuffed deer to pull an old wicker sleigh she had found in the attic when we pulled out the Christmas decorations. And I was reminded once again, that the kitchen truly is the ‘heart’ of the home. Here I stood in the epicenter of it all and felt the sheer bliss of that moment. When you become a mom, you realize the true joy that comes from creating the ‘magic’. 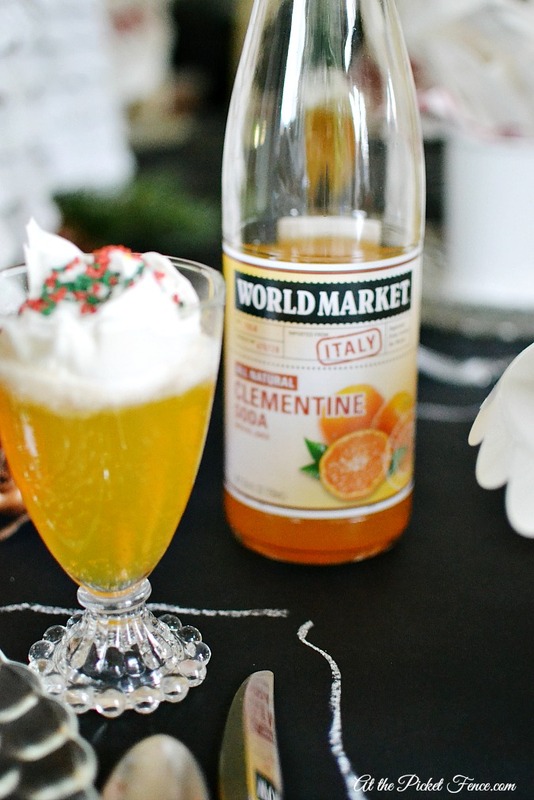 So, when World Market invited me, along with several other bloggers, to show off our Christmas kitchens, I felt my heart leap for joy. Because to me, my kitchen is where all of the magic of the season really takes place. 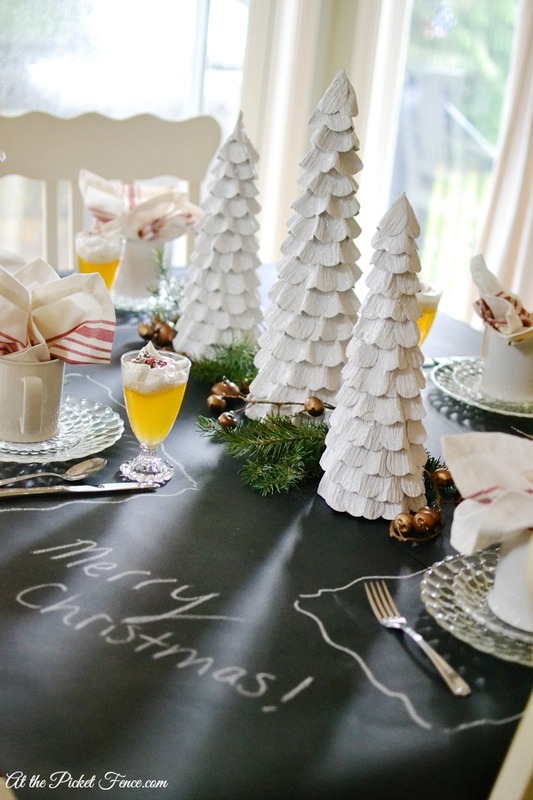 Like the magic of a Christmas morning breakfast complete with a chalkboard paper tablecloth. 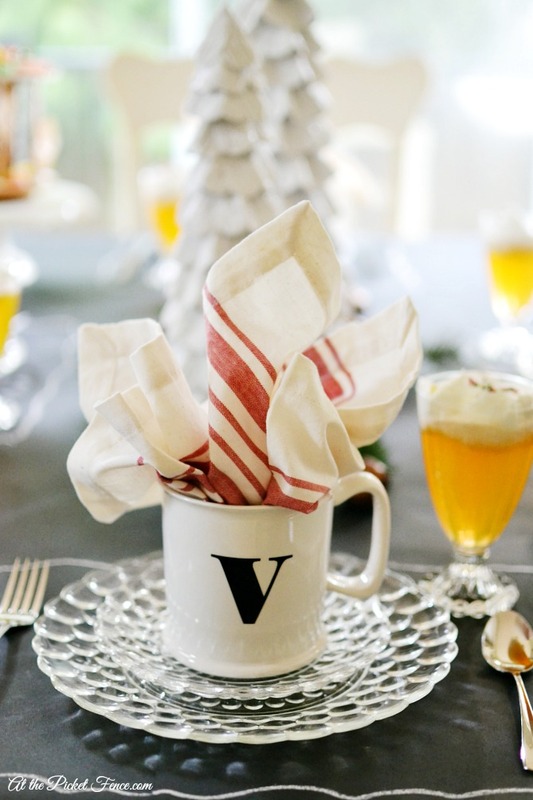 And the personal touch of a monogram mug with napkins reminiscent of candy canes sitting on top of the glass dishes my grandmother collected for me all of those years ago. There is definitely something magical about the linking of the old with the new. I’m certain that this jingle bell garland fell off of Santa’s sleigh as he flew over our house last year. And it looks perfect wound around a trio of sparkly white trees. On these cold, wintery days my kids love to come home from school and have a cup of hot cocoa. 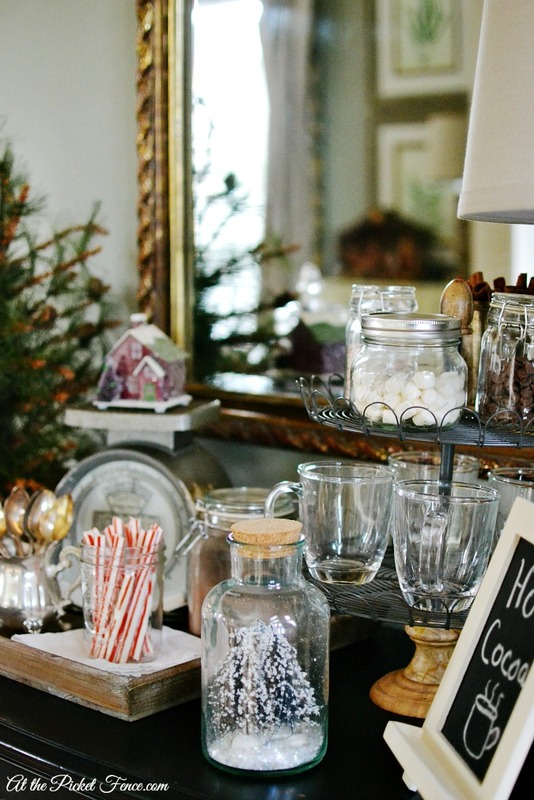 So a hot cocoa station is always a staple in our kitchen at Christmas. 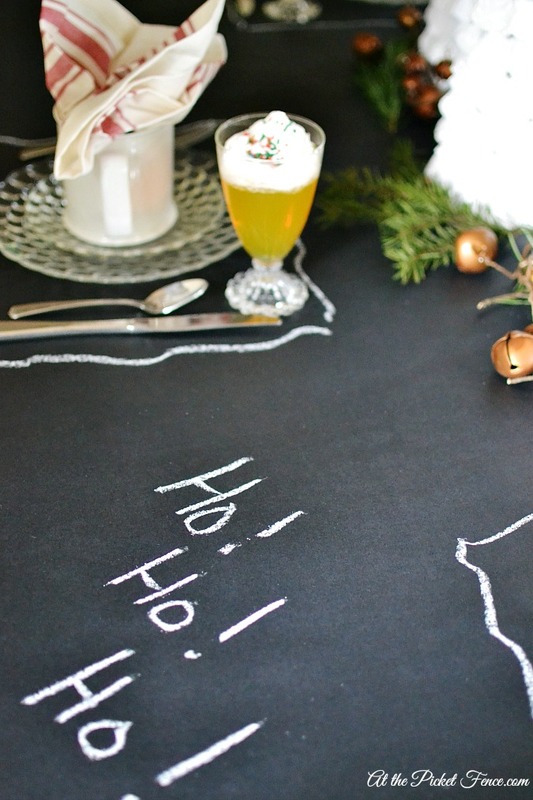 This little easel chalkboard creates the perfect welcome. What is it about sparkly little houses that add to the feeling of magic at Christmas? My daughter loves to imagine what they people are like who reside in this tiny abode. 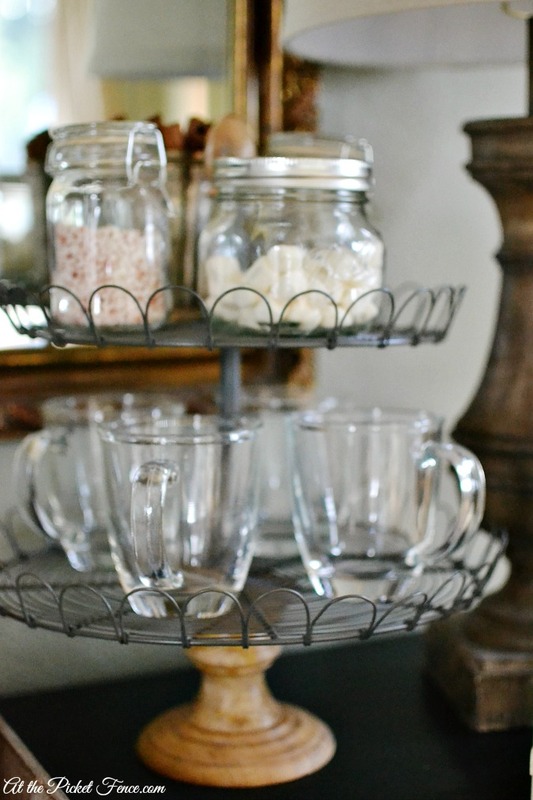 A tiered stand provides the perfect place for storing everything you need to make the perfect cup of hot cocoa. 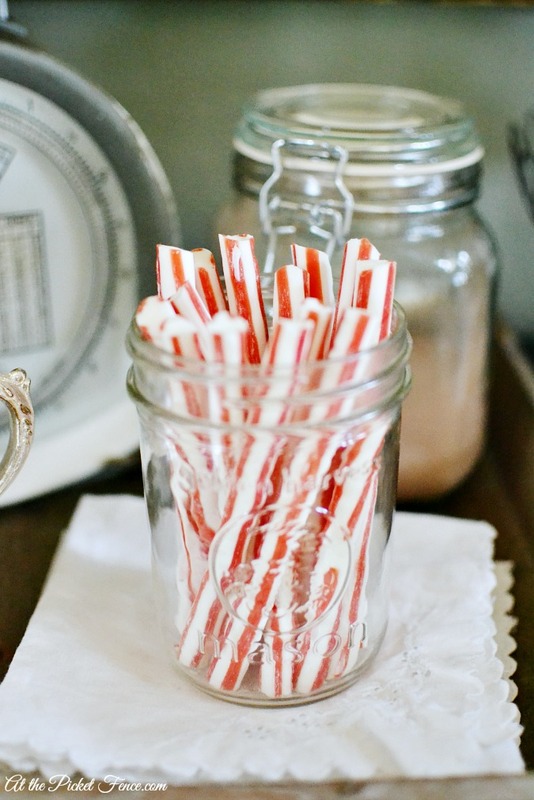 And why would you ever just use a spoon to stir your hot cocoa when you could use peppermint stirrers instead? 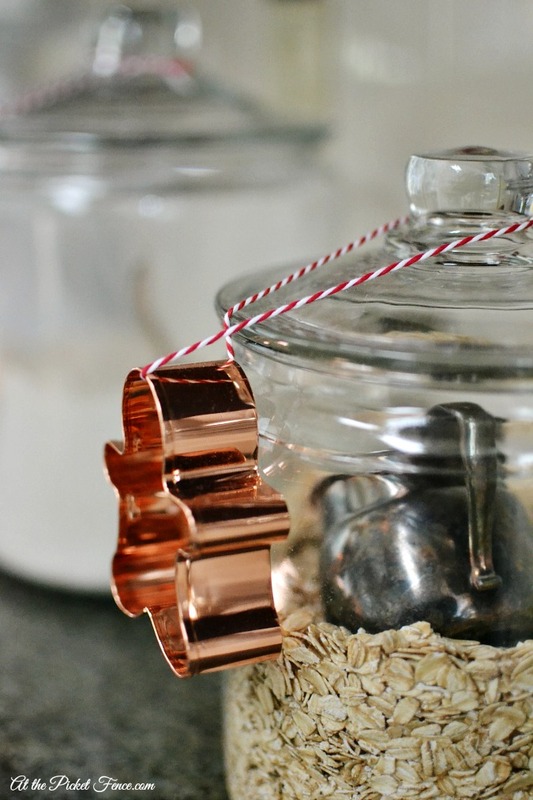 Capturing the magic of Christmas in your kitchen can be as simple as using bakers twine to add a small wreath to existing wall decor. Or proudly displaying the gingerbread carousel you and your daughter made on that magical weekend of blissful nothing-ness. 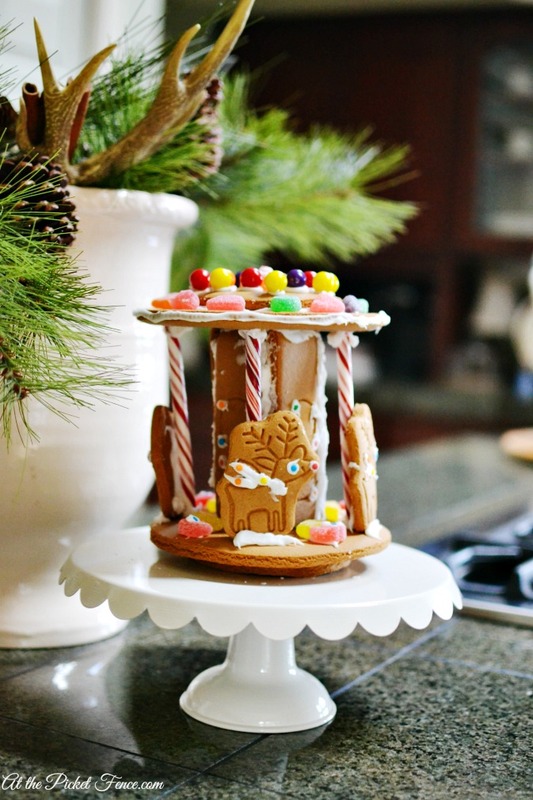 Elevated on a pretty cake stand it adds the perfect touch of whimsy to the kitchen. 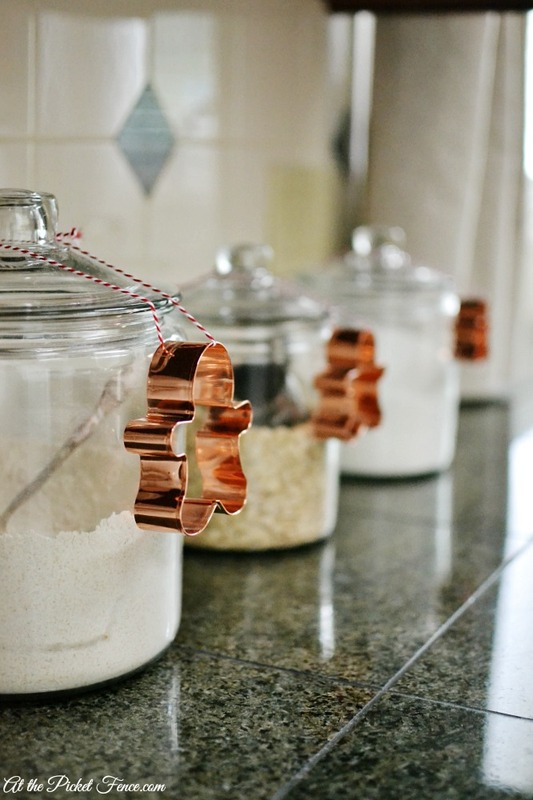 And a trio of gingerbread men cookie cutters tied on canisters hint at the wonderful baking to come. You know, my kitchen isn’t what I consider to be the most beautiful or the most perfectly decorated space in my home. The cabinets need to be painted and the floors need to be refinished. There are spelling lists tacked to bulletin boards and lunch boxes on the counter waiting to be packed for the next school day. Mail spills out of the basket on the desk and the sink is rarely void of dirty dishes. And yet, it’s my favorite room in the house. Because, like a heart, it’s constantly ‘pumping’ into the veins of our life. My kitchen almost feels like another member of our family. It works hard this time of the year to create those magical moments. Those moments when you fully realize how extraordinary those ordinary moments are. 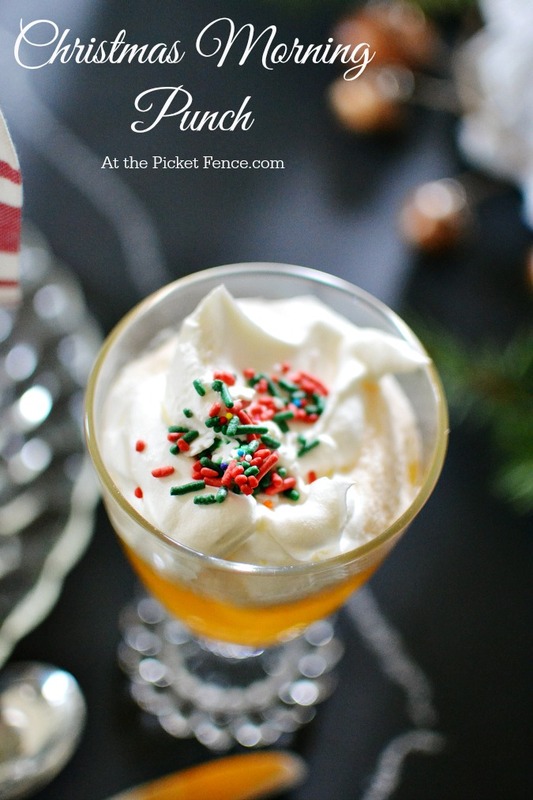 Like the look on the faces of your children when they see sprinkles on top of whipped cream on top of a sparkling and colorful concoction like this Christmas morning punch made with clementine soda. 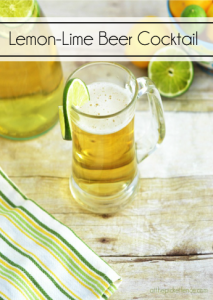 Mix together clementine soda, ginger ale, lime juice and orange juice in a pitcher and chill until ready to serve. 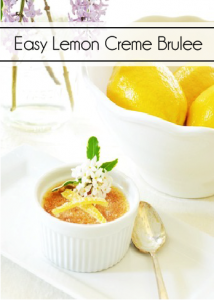 Add 2 tbps fresh orange juice to whipped cream and place a dollop on top of each glass. From the time my children were babies, I have found myself wishing I could bottle up every moment. Every time I felt their little hand slip into mine. Or the sound of their uncontrollable giggling. Or the spontaneous ‘I love you mommy’ that brings tears to my eyes each time without fail. And never have I wished for a magic bottle to capture those moments more than at Christmas. So, maybe I really don’t need magic bottles to hold those moments. Because I get to experience them over and over again every time I see their precious faces. 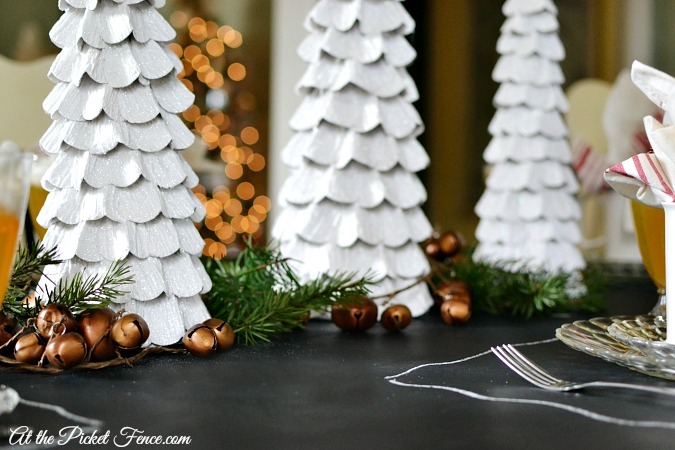 For more Christmas kitchen inspiration I hope you will visit these talented ladies! 21 Comments on "Christmas in the Kitchen"
Oh, Vanessa, your post brought a tear to my eye. 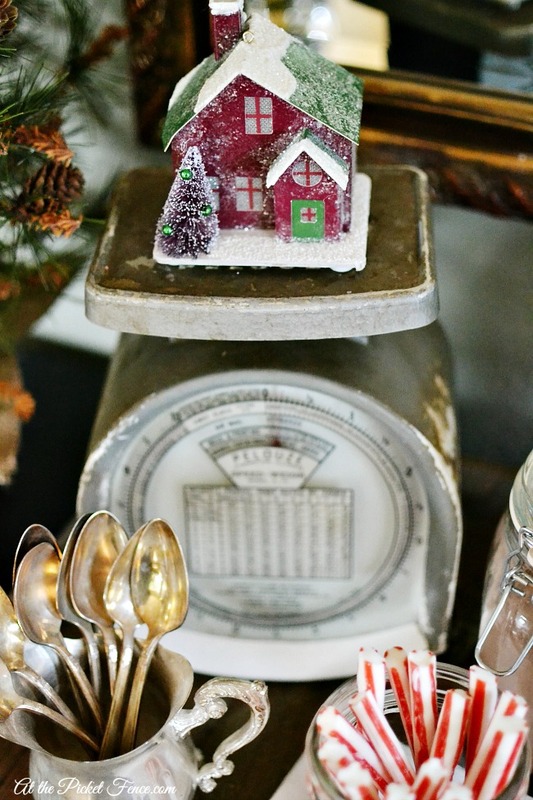 Love your kitchen and all of your sweet Christmas touches. It’s so nice to hear of a blogger actually taking the time to enjoy a Holiday weekend with family at this sometimes crazy busy time of year, Vanessa! 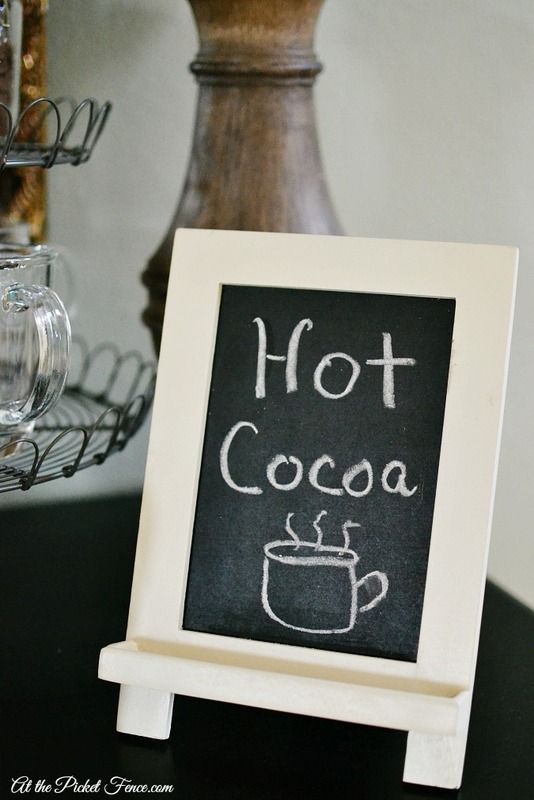 🙂 Your hot chocolate bar and chalkboard table setting are adorable! Love this! 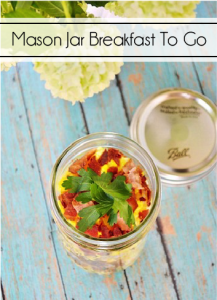 So many ideas to glean for my kitchen which I am working on today 🙂 Thought you would want to know that the Domesticly Speaking link simply goes back to your page. I want to jump right through my computer and sit and have a hot chocolate with you. I love your writing and how you bring it all to life. Your kitchen is absolutely beautiful. My home is quiet right now as my two boys have gone back to grad school and college after a delightful Thanksgiving weekend. Oh how I wish I could bottle the noise of this past weekend…grandog and all. Hang on to those wonderful memories with your little ones. They grow up so quickly. 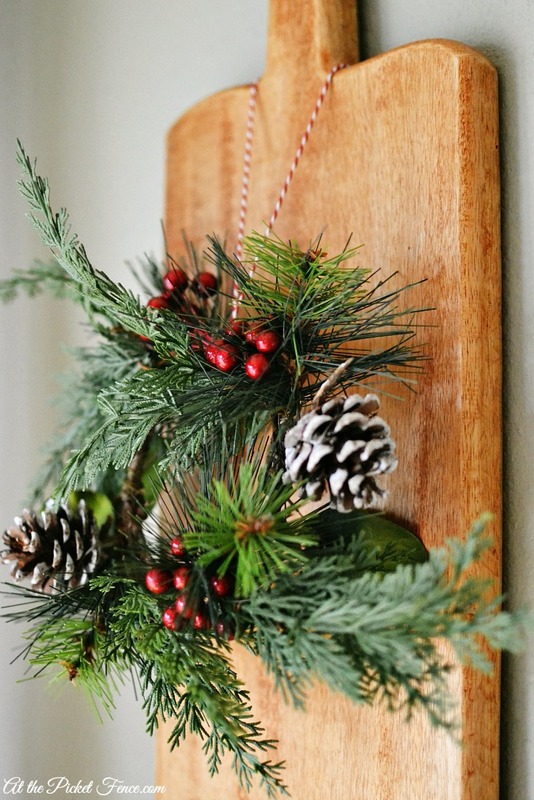 You really need to have a disclaimer at the top of each post that says, “grab tissues before reading,” I love the way you write, and all the festive little touches you added to your kitchen. Everything is just lovely. So pretty, love it all, ladies. Everything looks beautiful Vanessa!! 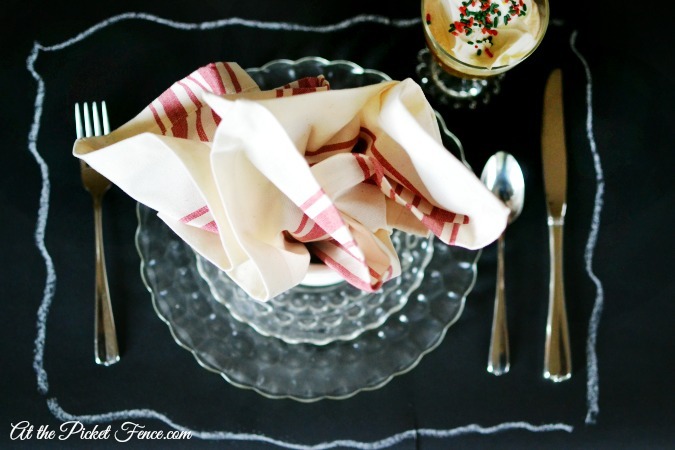 How cute is that chalkboard tablecloth…and I love your beverage stations…heck I loved it all!! 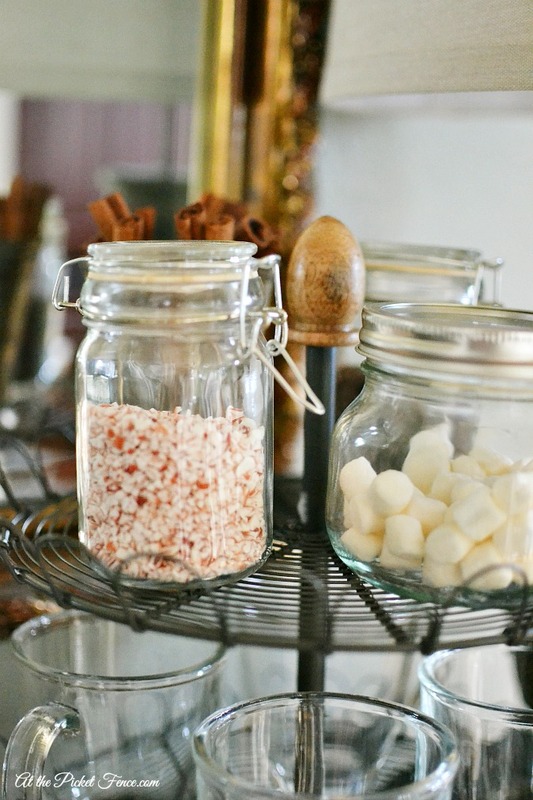 Love your hot cocoa bar…. my kiddos would love that spread. I know many sweet memories will be made in your home this Christmas! I want to spend time in the heart of your home, sitting at your beautiful holiday table! I love how you drew the placemats on chalkboard tablecloth, and I’m more than ready to fill my cup up at your cocoa station (I promise I’ll clean up after myself!) You’ve created such a thoughtful Christmas kitchen, Vanessa … one where, undoubtedly, magic and memories are certain to take place in the coming weeks! Love this whole post! And the white sparkly trees and gingerbread cookie cutters on your cannisters are adorable. Your home and kitchen looks so warm and cozy and I’m sure many fun and special memories will be made! Such a beautiful post Vanessa! And I just love that I’ve been in your kitchen and can appreciate this post so much more. 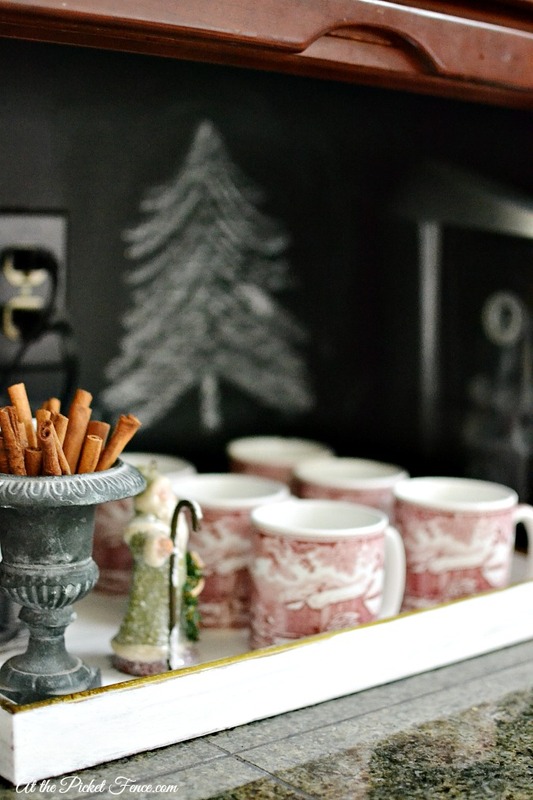 I love those monogram mugs and and the little chalkboard table. So sweet. Where did you get the chalkboard tablecloth? You’re absolutely right. Those “moments” we create are something truly special! Such a beautiful space you’ve made for your family! Such a cozy place to enjoy with your family and experience those special moments! I love every single detail! I don’t even think I can pick a favorite, everything is so pretty and perfect. I love it!